The Memorial Candle Program has been designed to help offset the costs associated with the hosting this Tribute Website in perpetuity. Through the lighting of a memorial candle, your thoughtful gesture will be recorded in the Book of Memories and the proceeds will go directly towards helping ensure that the family and friends of John Williams can continue to memorialize, re-visit, interact with each other and enhance this tribute for future generations. Obituary for John Emory Williams Jr.
John Emory Williams Jr., 82, of Pensacola, FL passed away on July 9, 2018 at 5:20 p.m. He was born in Panama City, FL on April 5, 1936 to his parents John and Marie Williams. Although John was born in Panama City he was raised in Cantonment, FL. As a child John was an adventures and charming young man, he enjoyed pulling his neighbor’s hair through the fence and later his neighbor became his wife and walking to school 3 miles, up hill in the snow barefooted. John Williams was a jack of all trades especially when it came to painting and served his country proudly. He enjoyed many hobbies such as fishing, spending time with his friends and family, and overall living life to the fullest. 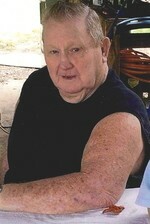 He is survived by his loving wife of 62 years Doris Williams, and children; Cindy Burkette (Mike Burkette), Kenneth Williams Sr., (Tara) Millard Malcom Williams, Stacey Williams, Cathy Williams; Brother, Celton Will; sister, Nancy Williams; sister-in-law, Mary Williams; 17 grandchildren, and 26 great grandchildren. And 1 ½ great-grandchildren. To send flowers to the family of John Emory Williams Jr., please visit our Heartfelt Sympathies Store.